The following car is a Daily Turismo exclusive that comes as a seller submission from DT reader Zach, who has owned the car since 1996 and penned a small novel about his experience with it. 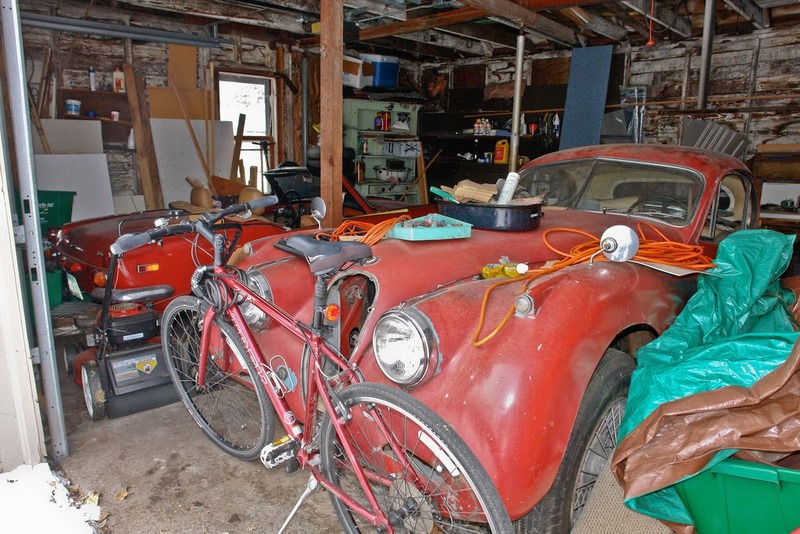 No...it isn't a barn find XK120, it is the Spitfire hiding in the corner. 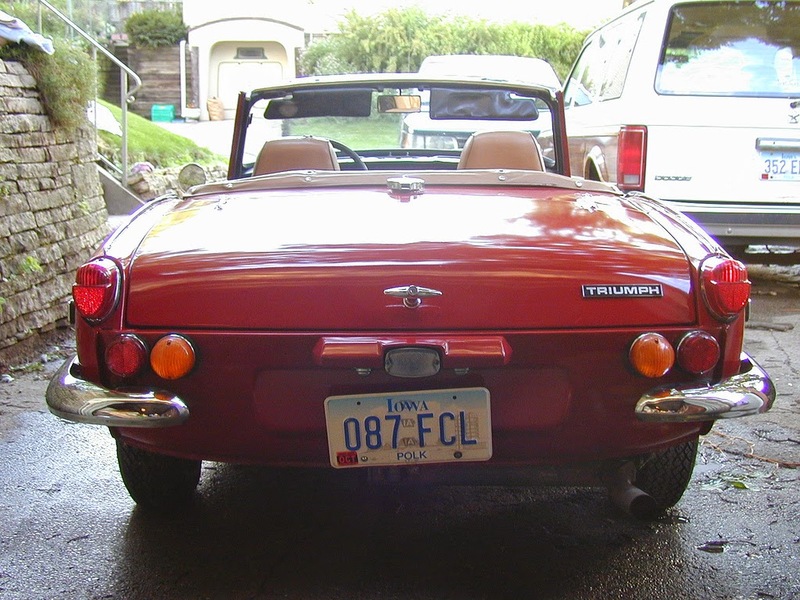 This 1970 Triumph Spitfire is offered for $1250 in Des Moines, IA. 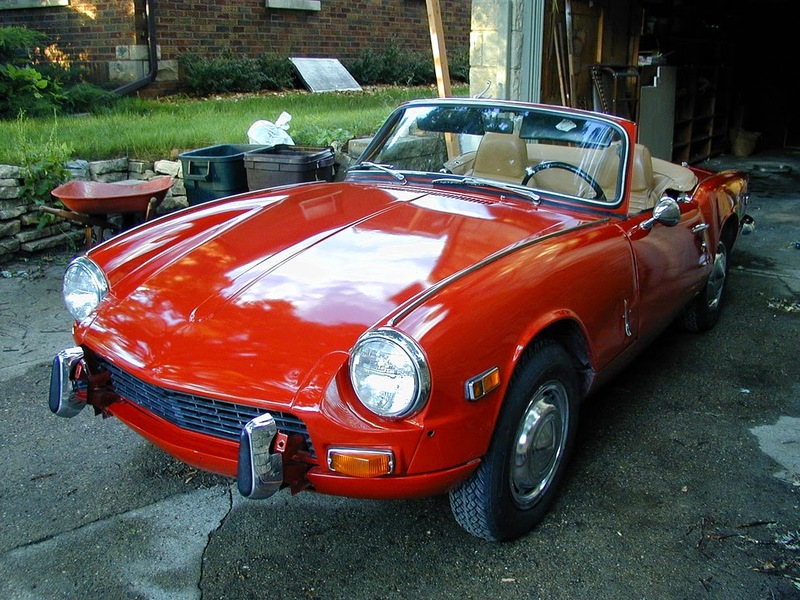 With a heavy heart and a bitter cup of reality in my hand, I've got to put my long beloved (and long neglected) 1970 Triumph Spitfire up for sale. The car was purchased in 1996, when I was little more than a (quite obvious in retrospect) bit nutty for odd, obsolete vehicles. My father had purchased a '53 Jaguar XK120 FHC in 1990 and had lit a fire underneath me that still burns to this day. I looked any any number of vehicles before finding the Spitfire, a rough TR3 with a Ford Pinto rack and pinion, a tatty TR6, various Karman Ghia, and other Spitfires before coming across this one in a lovely turd Sienna Brown (or about this color). Sure, the color wasn't the greatest, but hey, the seller had a couple of gallons of red paint that he'd mixed up for it with good intentions of painting it one day. A bit of hard-knuckle negotiation and not a whole lot of money changing hands later, it was mine. One exchange trip to Russia later and the car was repainted red and looked approximately like this (photo circa year 2000 - how about that slave cylinder leak?). 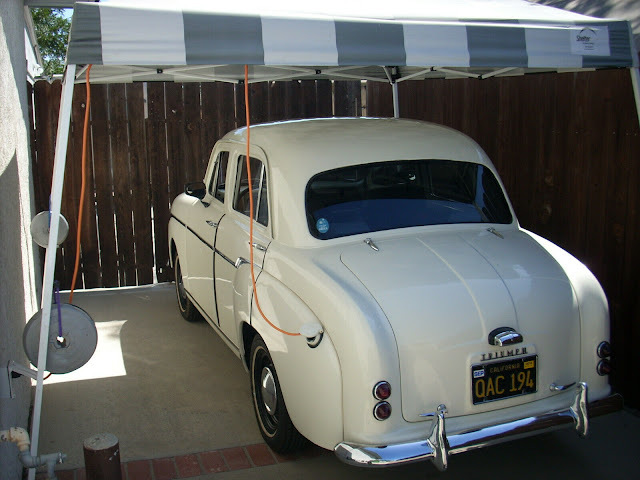 I drove the car during summers in Iowa between years at McGill University in Canada (eh!) before returning back to the midwest after graduation. Car was used actively for spring-autumn duty from 2001 through 2005. Many summertime (mis)adventures later (non-original 1147cc to non-original 1496cc engine swap, clutch replacements, I moved to Alaska and left the Spitfire in storage, where it's more or less sat for the past decade. While I don't want to sell the car, I also realize that it's time for a better caretaker to get her back on the road - the summers are too short up here in AK to make much out of it). The top photo is the most recent photo I have of it (ignore the XK120 in the foreground, please!). Hood (convertible top) was replaced somewhere around 2000 - though I suppose that still makes it around 15 years old, so not that new. Plastic was in good shape as of 2005. Ladder fell on the bonnet (hood) shortly after the 2000 picture was taken. I swore loudly and vehemently following this. Two small dents in hood that should be easily fixable, but as a poor recent graduate, I never corrected. Did I mention it's been sitting for 10 years? 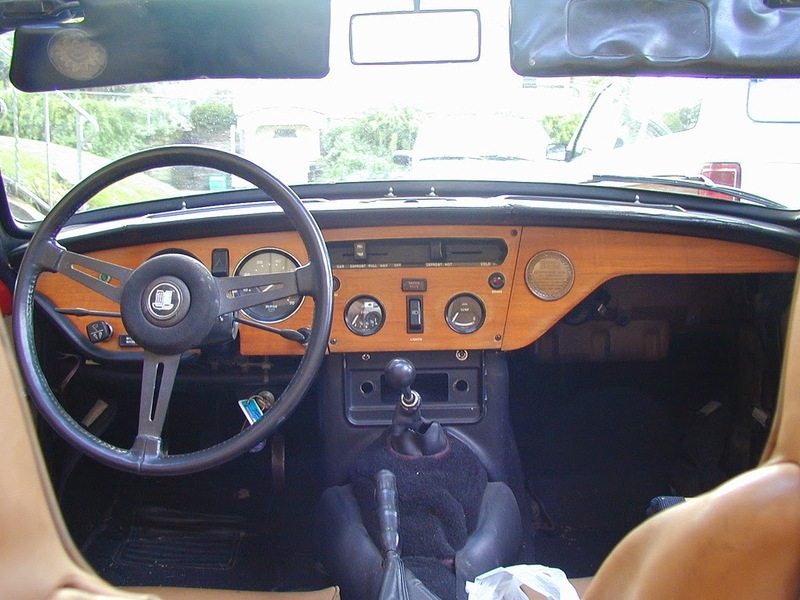 Couple of behind the dash issues that I never fixed (young, uneducated and hesitant to break things further) - fan blower never worked; windscreen pump never worked. Have spare blower assembly from GT6. Front bumper was dented when I purchased the car and I never mounted it - just rode with the over-riders. So she's not perfect and I still love her and hate to let her go. But she's 45 years old this and ready for her midlife crisis. While Spitfires are one of the more attractive designs in the little British car world (certainly in the cheaper end of the spectrum), they never managed to do a good job of shaking the 'hairdressers car' moniker... and thus prices for them have stayed mind-bendingly reasonable. Parts availability is fantastic and the internet support / fora are strong. I'd like to get $1,250 for the full kit and kaboodle. I may be crazy (but it just might be a lunatic [car] you're looking for). Bring a trailer tow dolly to remove from Des Moines, Iowa. Available for transport after 5/4, as I'm currently 4000 miles away. Glad to answer any and all questions. If you are interested in purchasing this car, please send us an email here: tips@dailyturismo.com and we will forward your contact info to Zach. 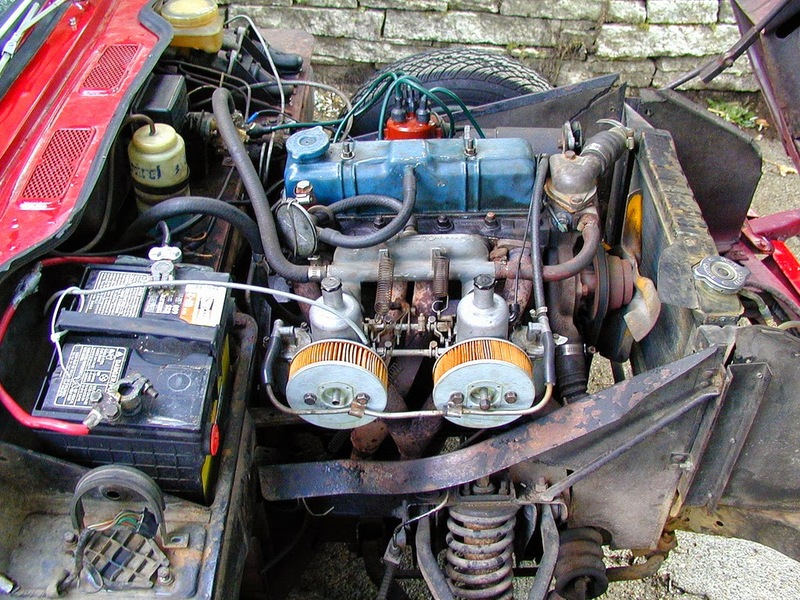 Boot, hood, bonnet, what is it with all these funky British words? It's like they're speaking a completely different language or something. Pretty car, but I'm kinda full-up on old British hardware at this point. I've never understood a single word that man said. I said, merphle offplathis boplith. But of course! 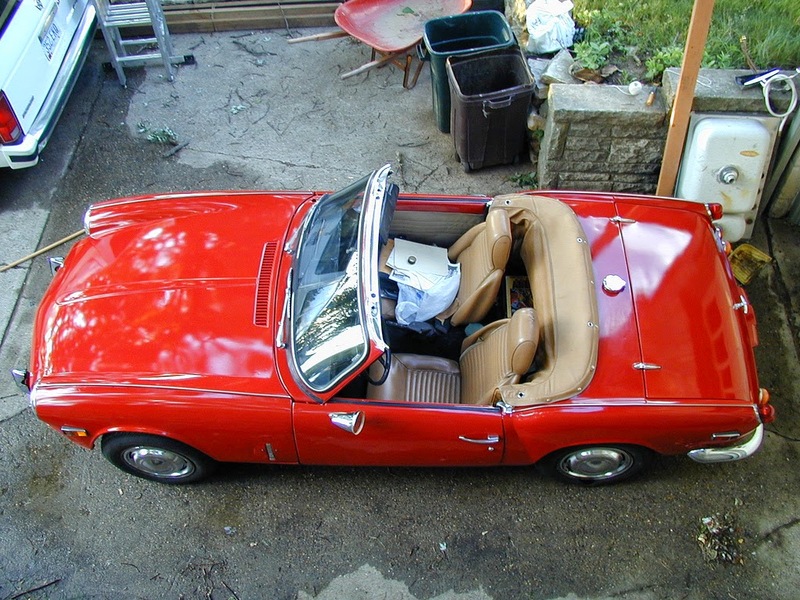 Triumph Spitfire, words words words, words, XK120. Ok, I will take the XK! Yeah, sorry for the lack of great, recent pictures. The XK is not on the market - I REPEAT - the XK is not on the market. Lots of fun even if not going especially fast. Ha, thanks for putting your Triumph up here Zach. Really nice deal. Something like this to disguise it? Thanks everybody. I'm here all week. Tip your waitress or waiter and enjoy the prime rib! I told her to stay out of bars and don't take any wooden nickels. That's a double tip! Best of luck, Zach! I hope your car gets a wonderful new home where they'll care for it as much as you did. Thanks K2. My backlog of useless knowledge had to have a root somewhere - now you know. Ha ha! Now I know! DT is a perfect place for some of that knowledge. ~ Best of luck, Zach. I shared the DT article with Shawn F. on his FB page, since we all three share a Polk County link. He tells me that when he called, you already knew of him. Hope that a good steward can be quickly found and the Spitfire returned to its rightful glory. Good luck with the sale Zach. The car is definitely priced to sell. Great story, glad you got to enjoy the car before selling it. Get someone to haul it up to the Mucky Duck Pub in Ames. Some Anglophile will snap it up before tea is over. Zach, I am ready to travel to IA and haul it back to GA. I sent contact info thru DT tips.